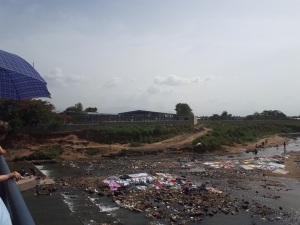 Standing on a bridge halfway between the Dominican Republic and Haiti, looking down on a garbage-strewn trickle of a river where naked children frolicked and women bent over laundry and a man watered goats under a midday Caribbean sun I felt the distance from Canada. Across the bridge I could see the chaotic bustle of a Haitian market, people milling about. Behind me was a Free Trade Zone complex of factories, manufacturing underwear and sportswear for the global market. The complex was manicured, roads straight, all purpose built for the efficient purpose of making money. I had thought I understood the inequities of the global economy before. At least the principal. But standing in the thrall of it, the smell of woodsmoke and garbage, the sound of laughing children and the bustle of the marketplace contrasted so starkly to the noisy hum of the factory floor that my head swam. As a social studies teacher at a Jesuit school, making real the inequalities of the Global Market is a mandate I take seriously. 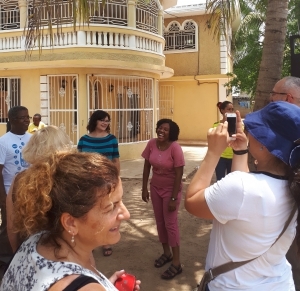 The opportunity to visit both the Dominican Republic and Haiti with Canadian Jesuits International in July 2018 seemed a good way to help fulfill this objective. But any trip that immerses you, for even a short time in the despairs and hopes of migrant Haitians toiling in obscene conditions on a Dominican banana plantation clarifies the economic, ecological and political consequences of our buying cheap bananas. Suddenly, you feel responsible that a Canadian mining corporation set up one of the largest gold mines in the world that destroyed the traditional way of life of Dominican farmers and ruined the local waters. 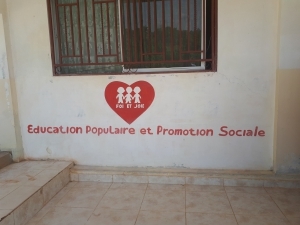 And your heart cannot help but soar at the sweat and toil of the Church and volunteers to construct Fe Y Alegria (Foi et Joie in Haitian Creole) schools to make better the lives for children today, and tomorrow. Finally, there is a responsibility to bear witness and to stand for justice- ecologically, economically and politically- in our own corner of the world. For in this way do we show solidarity.